Are you looking for something new and fun to watch as a family? Check out The Deep, now available to stream on Netflix, based on the Aurealis Award-winning graphic novels from #1 New York Times bestselling comic book author Tom Taylor! The Deep is a visually stunning underwater adventure series for kids ages 6 – 12 and their families! The Deep follows the adventures of the Nekton family—a brilliant team of underwater explorers. There’s 12-year-old Antaeus (Ant); his analytical 15-year-old sister Fontaine, an astute navigator; and their parents Will, an oceanographer, and Kaiko, a marine biologist; and, of course… Ant’s pet fish! Continuing a long family legacy, the Nektons live aboard a state-of-the-art submarine, the Aronnax, while exploring uncharted areas of the earth’s oceans to unravel the mysteries of the deep sea where most of our world lies unexplored and unexplained. While others look up to the stars, this family knows that an infinite number of things shine brightly in the darkness below. The Deep is a place where sea monsters swim through sunken cities, pirates lurk amidst floating black markets, and where a mysterious group of Guardians hide long lost secrets. 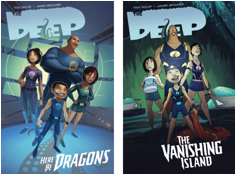 The Deep is based on the graphic novels The Deep: Here Be Dragons (SRP: $11.95) and The Deep: The Vanishing Island (SRP: $11.95), authored by Taylor, illustrated by James Brouwer, and published by Gestalt Comics, each featuring 80 full-color pages that you can read with your children. Both titles can be purchased at Last Gasp Books and Comics. Or check out The Deep web page at Australia based Gestalt Comics for more information and other digital purchases. We have teamed up with Technicolor for a Giveaway Opportunity! Technicolor is the underlying rights holder to The Deep, which is co-produced by Australia-based A Stark Production and Canada-based DHX Media. One winner will win these delightful books! To enter, leave a comment below telling us why you think you and your children would like to watch the series! Deadline to enter is July 11. 2016 at noon PST. Only U.S. participants only please. Self Disclosure: I received copies of the books to facilitate this post. No other compensation was received. SoCal City Kids will select the winner via Random.org and the books will be sent to the winner. Scuba diving and ocean life has always been a deep interest in my family, these sound great for us. I know my daughter’s would enjoy reading these. this looks like a fun adventure series my daughter will love!